This photo shows the moon one day before it reached “first quarter,” with the disc 44 percent illuminated by the sun. Miguel Claro of Lisbon, Portugal captured the image on March 7, 2014. The delicate play between light and shadow brilliantly reveals the surface of the moon in these images recently sent to Space.com. Astrophotographer Miguel Claro of Lisbon, Portugal, captured the stunning photo one day before the moon reached "first quarter," with the disc 44-percent illuminated by the sun. 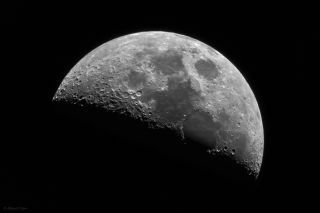 This photo shows the moon one day before it reached “first quarter,” with the disc 44 percent illuminated by the sun. Miguel Claro of Lisbon, Portugal captured the image on March 7, 2014. In this annotated version, Claro changed the inverted position of the original photo caused by the mirrors in his Maksutov telescope. Claro took the image on March 7 using Canon 50D and Maksutov telescope F=1250 mm, and a Vixen GP2 Photo Guider S tracking mount (ISO 1000; f/ 13.8; Exp: 1/80 sec. in 07/03/2014 at 23:08. Median Sum of 10 images in Maxim DL). He also included an annotated version of the image, seen at a different angle. In this version, Claro changed the inverted position caused by the mirrors in his Maksutov telescope. "It's very interesting to see the difference when we look at the same picture, but at a different angle," Claro wrote. "We can easily see some craters in the original captured position and others in the corrected inverted position." Editor's note: If you have an amazing night sky photo or video that you'd like to share for a possible story or image gallery, please send images and comments to managing editor Tariq Malik at spacephotos@space.com.